Easy chocolate pudding recipe made in the blender. Homemade chocolate pudding has never been easier and faster to make, no stove top or heat required! 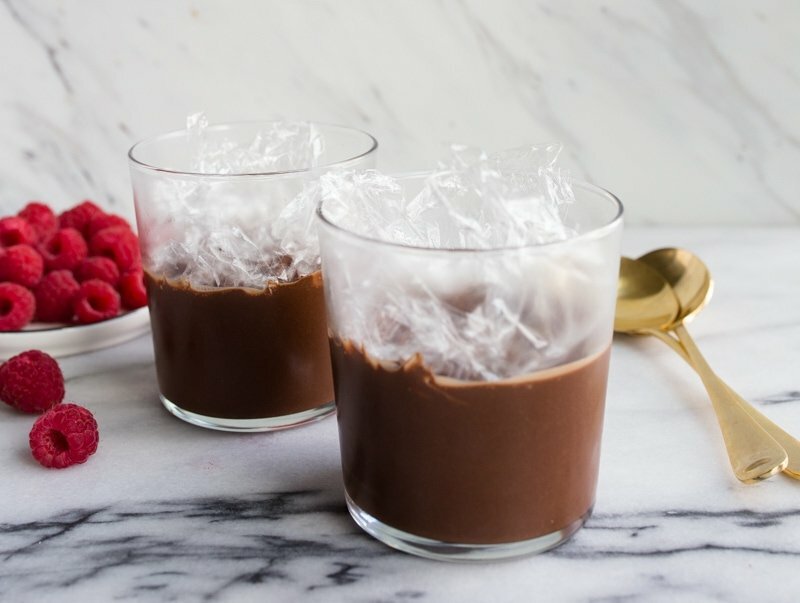 Tucked into my second cookbook, Comfort and Joy: Cooking for Two, is a little recipe in the dessert section for chocolate pot de crème made in the food processor. It’s an insanely easy recipe that doesn’t require any heat or cornstarch. I love it, and so I decided to share it with you today. Plus, if you absolutely cannot wait for my next cookbook all about cooking for two (titled Dinner just for Two and due out in April of 2019! ), then Comfort and Joy is what you should put in your little paws to pass the time. 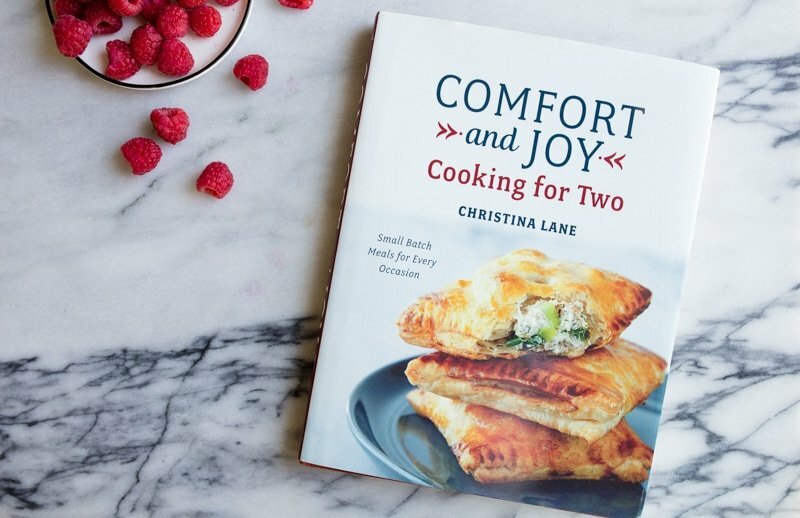 Comfort and Joy has breakfast recipes for two, lunches for two, dinners for two, and small batch comfort foods. 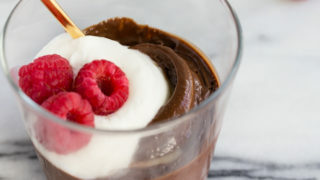 And an easy chocolate pudding recipe made in the blender, of course! I’ve been playing around with the original recipe to make it in my blender, and to make it softer, like homemade chocolate pudding. It turns out, you don’t have to change a thing about the recipe, just the chill time! The mixture comes straight out of the blender and sets into pudding in 60-90 minutes in the fridge. If you leave it in the fridge longer, it’s thicker, more like a mousse or pot de crème. You can eat it that way, of course, but you can also let it rest on the counter until it softens to the texture of chocolate pudding. 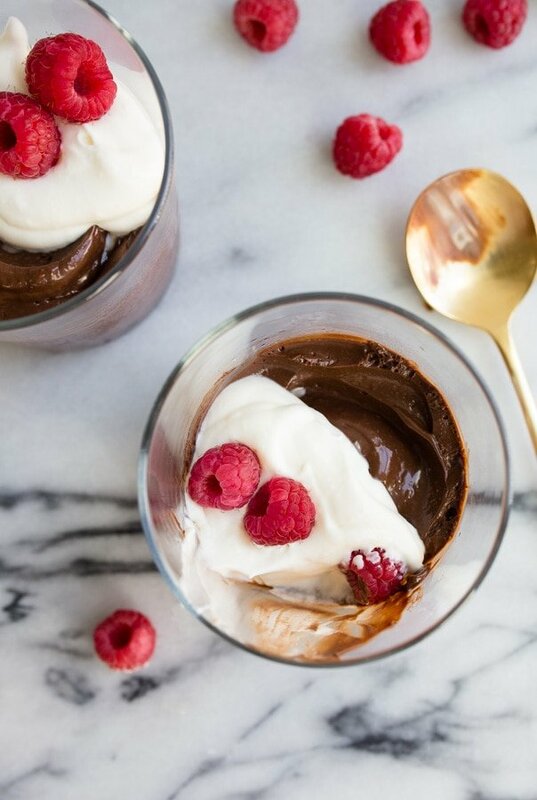 You have so many options with this homemade chocolate pudding recipe! I love that this recipe only makes 2 servings of pudding, because I really need portion control when it comes to pudding! 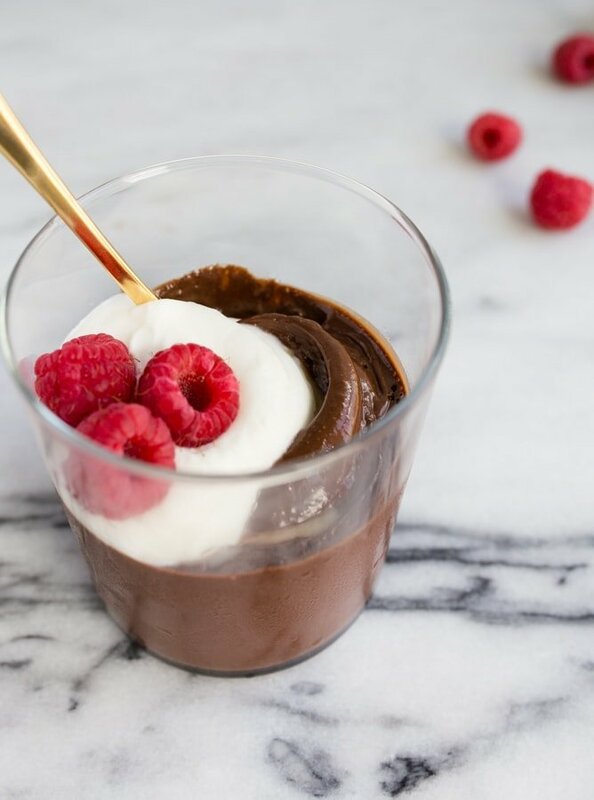 The beauty of this easy chocolate pudding recipe is that it doesn’t requite cornstarch or any heat to make! You really have no excuse to buy instant pudding anymore, heh. You just use a blender to break up the chocolate with the sugar, stream in heavy cream and a shot of espresso, and blend! There are a few other ingredients, like salt and vanilla, but you get the point. I use my Vitamix blender to make this recipe. I upgraded to a Vitamix when Camille was a baby, because I knew I wanted to make her baby food from scratch. I’ve been endlessly impressed with how easy it is to use, how perfectly smooth and silky it makes purees. Plus, it has a heat function to make soups! I love it! Here’s a link to get $20 off your purchase and FREE SHIPPING on a new Vitamix for you! This recipe uses just the yolk of 1 egg. My recipes are divided on this site into recipes that use egg yolks and recipes that use egg whites. Browse through the egg white recipe section, and find something to make with the leftover egg white. We eat this homemade chocolate pudding with extra whipped cream and raspberries on top, but since Halloween is coming, I want to make Camille a homemade dirt and worms cup! It’s seriously one of my favorite desserts, and I know she’s going to love it, too! To make that, I would just layer the pudding with some crushed Oreos in a small jar, and then push in some gummy worms. So easy! You can also use this to make my mini chocolate cream pie for two, gluten free chocolate meringue pie, or chocolate pudding cupcakes. If you feel like mixing things up, stuff my small batch eclairs with it or use it as the filing in my Boston Cream Pie Cupcakes. Easy chocolate pudding recipe made in the blender to serve two. In a high-speed blender, add the chopped chocolate, sugar, and salt. Pulse 15 times to break up the chocolate into smaller pieces. Next, add the egg yolk and vanilla and pulse another 15 times. Warm the heavy cream in the microwave until it's steaming (and the espresso if it isn't steaming hot). With the blender running, stream in the hot cream and hot espresso. Run the blender for another 30 seconds, stopping to push the mixture from the sides, if necessary. When the mixture looks homogenous, divide it between two serving glasses. Place plastic wrap directly on the surface of the pudding, and chill in the fridge for 60-90 minutes. Check the texture before serving: if it's too soft, place it back in the fridge; if it's too firm, let it rest on the counter before serving. Serve with extra whipped cream and fresh raspberries (optional). *You may substitute 3/4 cup of semisweet chocolate chips for the chopped chocolate. *If you don't have an espresso maker, use 1 teaspoon of instant espresso powder dissolved into 1/4 cup of boiling water. I am wondering if I would need to make any adjustments if I used Lily’s Premium Baking Dark Chocolate Chips instead of regular chocolate. I like Lily’s because it has less sugar. I just discovered Lily’s, too! I bet you can use them! Maybe the pudding won’t be AS sweet, but I’m sure it will still be good! I think with less sugar, the coffee flavor will be more pronounced, just a heads up :) Enjoy!!! very creative,innovative idea and product and very well illustrated in the form of words and pictures! All I can say is Oh My Goodness!! Can’t wait to try this. I’ve had a Vitamix for several years and love it! I’m sure I will love it even more now. Thanks so much from another Texas sister! This looks delicious! Do you think it would work in a normal blender (not a high speed one)? This looks insanely addicting! Plus, I love the idea of making it Halloween friendly with the dirt and worms. So cute! This appeared just in time for my birthday! It was a great way to celebrate while avoiding the stress I usually put myself through making chocolate mousse. Got my chocolate fix with an easy clean up and more time to enjoy a little more wine. Kudos Christina. I am wondering about the raw egg yolk. Does the hot milk heat it enough? It does heat it, but probably not to exactly the right temp. If you’re worried, use a pasteurized egg. The egg yolk thickens the mixture :) You can leave it out if you prefer. oh myyyy this pudding looks so silky and chocolatey! I only had 1/2 C cream in my fridge but wanted to try this out, so I added 1/4 C whole milk. It still turned out perfectly. Definitely adding this recipe to my rotation! Thank you! I want to make this for my daughters halloween party at school — if we make it the night before, do you reccomend keeping it in the fridge or out? The first time I made this it was flawless! The second time it wouldn’t set, could it be because I whirled the chocolate chunks in the blender for too long trying to break them up? Any advice would be appreciate! Also, any way to use Kraft caramel chunks to make a caramel flavored version of this easy blender pudding? Thank you so much! Hmm…did you use the same type of chocolate the second time? Breaking up the chocolate too much shouldn’t affect things. Did you let it rest in the fridge? The chocolate firms as it chills. Yes! Everything was the same and I let it chill even longer than the first time. I will have to try this one more time. Again, any idea on using the Kraft baking caramel for a flavor twist? Thank you! This is so strange! Was it chunky? My best guess is that the chocolate didn’t have enough fat to solidify. Same chocolate as last time? Or maybe I should have specified: heavy WHIPPING cream, not just heavy single cream. This could be eat! The chocolate, cream, and egg yolk set the mixture. It has 3 thickening/ setting agents. Can’t wait to try it again and the caramel version, you’re the best. Thanks for responding! The recipe calls for heating the cream in the microwave, and the blender itself heats the pudding via friction. Saying this recipe is made without heat is illogical and misleading, and with the inclusion of egg would be dangerous if accurate. I disagree. But thanks for providing your negative critique of a recipe you’ve never tried. I am looking for a recipe that genuinely uses no heat. “stream in the hot cream and hot espresso.” is not it. No microwave for me but if I did use one it would still be using heat to set the pudding anyway. 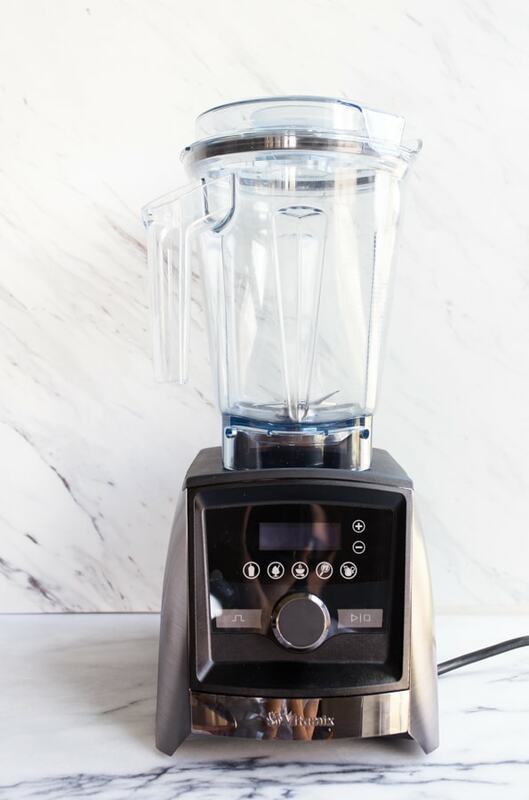 Already have a great recipe that safely cooks (to over 180oF) just in the VitaMix without any external heating (or extra bowls to clean) in under 7 mins of total blending time. I need an uncooked recipe without heat at any stage but stills tastes good. Obviously eggs are out. Maybe using avocado/cocoa/agave? Haven’t found a good one yet. When your headline said “no stove top or heat required” I was initially hopeful this was it. Anyway, I wasn’t trying to be negative about your recipe, am sure it works great and appreciate the absence of flour or cornstarch, but I still find it misleading to say no heat.